In this latest addition to the Biggest, Littlest! 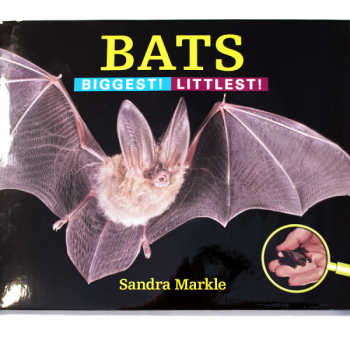 series, award-winning author Sandra Markle explores the diverse world of bats. How does being big help one kind of bat? How does being little help another kind? Sometimes these extremes offer the key to survival. The biggest bat is the Flying Fox, which can have a wingspan as long as a bathtub. Its littlest cousin is the Bumblebee Bat, which weighs only as much as a penny. Stunning photographs from around the world invite young readers to investigate up close the features that make each bat unique. Ages: 5-7, 32 pages, hardcover.